Hey ya'll and happy FRIDAY! Woor woot! This week, in my opinion, flew by and I'm totally ok with that because it is time for the weekend! This week we visited our local produce stand that is now open, had a girls shopping evening with Miss A, went for many strolls with the nice weather, sent out 1st b-day party thank you notes, rocked my new Mom tee from my friend Tiff and even booked our hotels for 3 future weddings coming up. We're on top of it huh? (for once..) It felt like a very productive week! Also this week, my first ever Larua Dro Designs original canvas shipped! I actually won it on an insta giveaway but totally plan to purchase more from her. Her work is so fabulous and bright and would you believe that the one I received is a pineapple? AH LOVE! I'm going to have it framed and then find the perfect spot for that beauty! Ok ya'll know I love me some Twitter right? Well I have a new Twitter claim to fame this week (Biana, here we go again!) 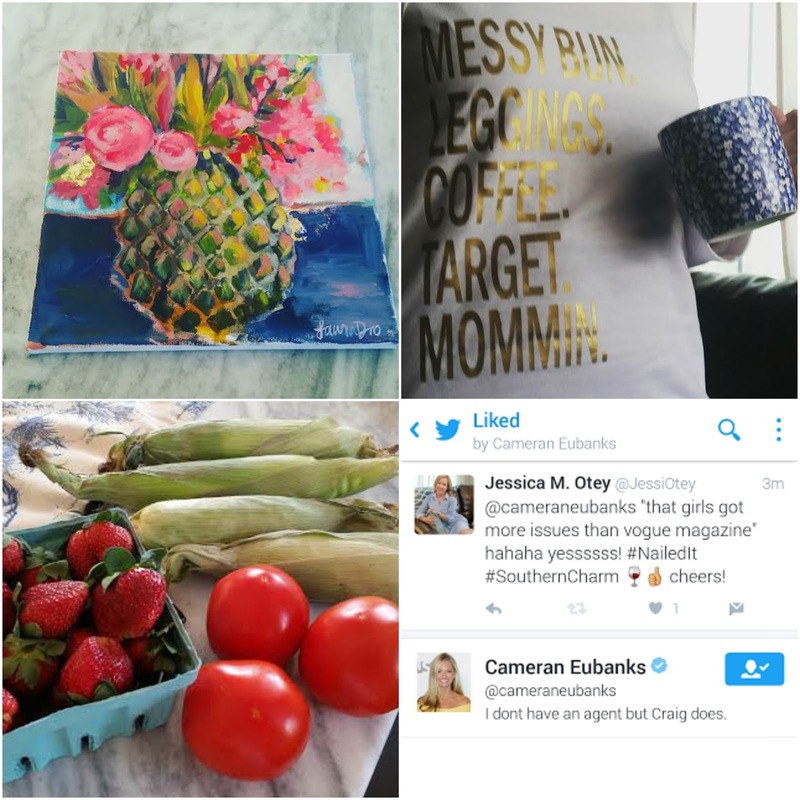 Cameran from Southern Charm favorited my tweet during Monday night's show and I was so pumped - last week Patricia and now Cam - she is totally my spirit animal ya'll! Adore that girl! If you don't watch Southern Charm on Bravo, start watching asap! I'm linking up today with April from A. Liz Adventures, Amanda over at Meet @ the Barre , Karli with September Farm. and Andrea from Momfessionals for Friday 5 and Friday Favorites. Join in! Southern Charm is my favorite! And I love Cameran too! Love the print you got! Two of my favorite things in one blog post! Laura Dro Designs and Southern Charm! And omg patricia is going to start selling long mumu dresses....I am stoked!!!!!!! I just love Cameran. And that pineapple print - yes please! Happy Weekend! I cant believe how big and beautiful Miss A is! 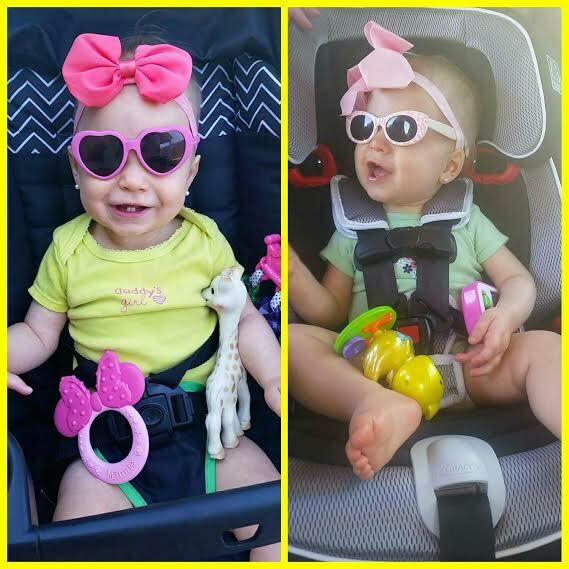 She is rocking those sunglasses! Great job winning that canvas! I love the pineapple print! That painting is stunning and absolutely my taste as well. I'm having giveaway envy ;) The bigger the bow, the higher to God so Miss A. is set! Too cute! LOVE that pineapple canvas you won!! I really need to start watching Southern Charm, it seems like everyone loves it! That canvas is SO pretty!! Haha, you and your Twitter! That is so cool! That pineapple canvas - amazing! Cameran is seriously the best!